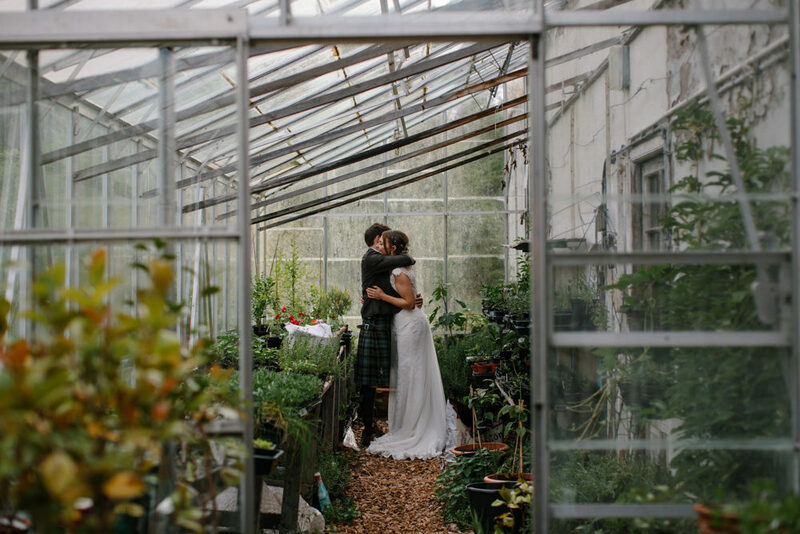 There are so many wedding venue gems hidden away in Scotland, like Colstoun. I love featuring Scottish weddings because I get to nose inside them (virtually of course) and admire how you lovely people decorate them. 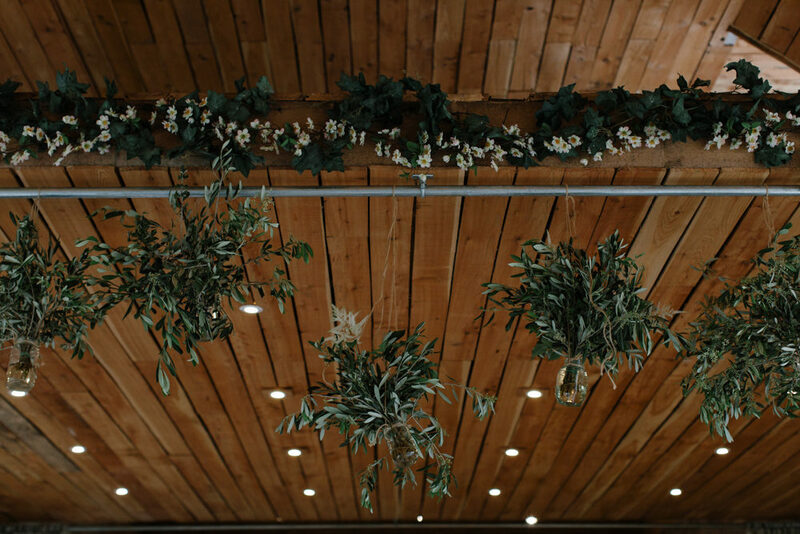 Jen and Sean went to town with foliage, well and truly bringing the outdoors in for their reception. 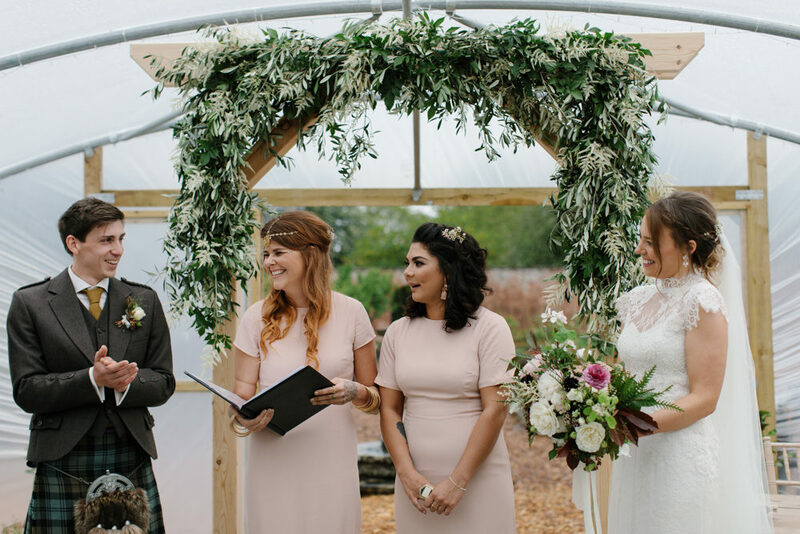 Their ceremony followed the same notion, taking place in the venue’s polytunnel while the rain hammered down above them – luckily this is happens to be one of the most romantic sounds in the world. Jen the Bride: I remember my nerves slowly growing as my hair & makeup was being finished, being helped into my dress and the cottage emptying of all but the bridesmaids & my dad. I will never forget the feeling I got right before the ceremony, as I approached the poly tunnel with my dad and my bridesmaids. Seeing the silhouettes of our guests inside, hearing them laughing and talking with the string quartet playing mixed with the sound of the rain on the canopy was incredibly exciting. The butterflies I got when my last bridesmaid turned from me, smiling, and disappeared into the poly tunnel before it was just my dad & I left to do the same! Unreal. Then it was our turn to go, and seeing Sean for the first time truly settled my nerves, and I was so excited for the day to begin. I walked down the aisle to ‘String Reprise / Treaty’ by Leonard Cohen, arranged and played beautifully by The Cairn String Quartet. It was perfect. During the ceremony, it rained on and off. When the rain got so loud that some guests struggled to hear, Tim (ever the professional) paused the ceremony to wait for the rain to die down. Sounds disastrous, but it was hilarious! There was also something quite magical about how hard it was raining, it somehow felt significant & cleansing. We incorporated a game of rock paper scissors to decide who got to speak their vows first, as this is how we resolve many dilemmas. Our vows were built from what we each wanted out of marriage (with a few extras thrown in there too! ), so it meant that we were able to make promises to one another that are actually relevant and therefore a lot more meaningful. We included a ring-warming ceremony and a guest-spoken Apache wedding blessing, as we wanted our guests to be a part of the ceremony too. It meant that the day was not just a celebration of our love for each other, but also our love for all of our friends and family, and was a small acknowledgement of everything they’d done for us that meant we could all be there that day. We had one of Sean’s best friends from school & singer in his band be our Master of Ceremonies. He was so fantastic and managed to drum up so much atmosphere and energy! As he announced us into the reception, the whole room started thundering and cheering – I remember it was so loud and felt so electric that I got goosebumps. Sean and I looked at each other nervously right before stepping into thunderous applause and cheers – it was such an amazing moment. The speeches were a hit and I was so proud of everyone. There wasn’t a dry eye in the house when my dad spoke of seeing the flashing light of my heartbeat at my mum’s first sonogram. Our first dance was ‘About Today’ by The National, from one of our favourite albums ‘Cherry Tree’. In the end, it was the obvious choice, but we deliberated for so long that we actually didn’t even choose it until the day before the wedding! As the ceilidh kicked off, thankfully the rain went off and the sun came out, and we went out to the Walled Garden to get some shots with Caro. That was a really nice time, when it was just us – it gave us some breathing space and a chance to catch up with each other. The whole weekend was just perfect. 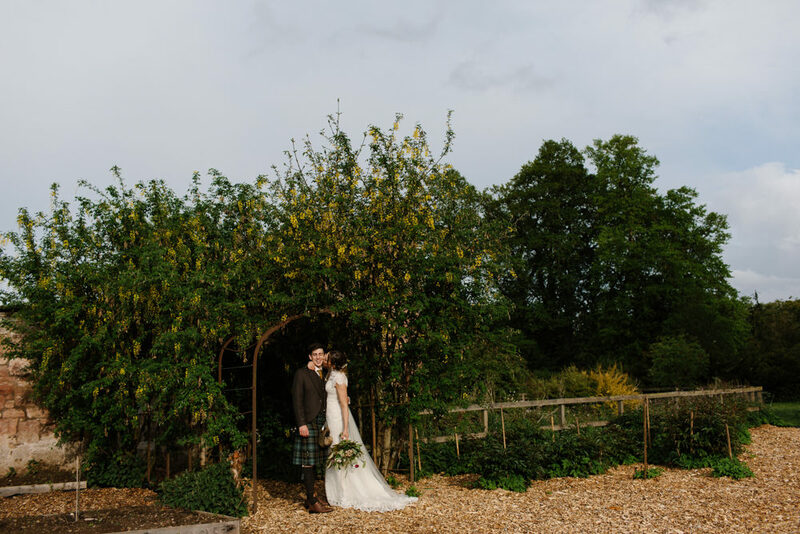 All of our guests have told us how unique they found it – they had certainly never been to a wedding in a poly tunnel before! Sean and I were on cloud 9 afterwards. I wouldn’t change any of it, even (dare I say it, especially) the rain. I was visiting my best friend in Brighton when she told me about an amazing wedding dress shop she’d passed a few times. We booked an appointment and I fell in love with the very first dress I tried on, which had been designed and meticulously made by hand by Blanca who owns the boutique. 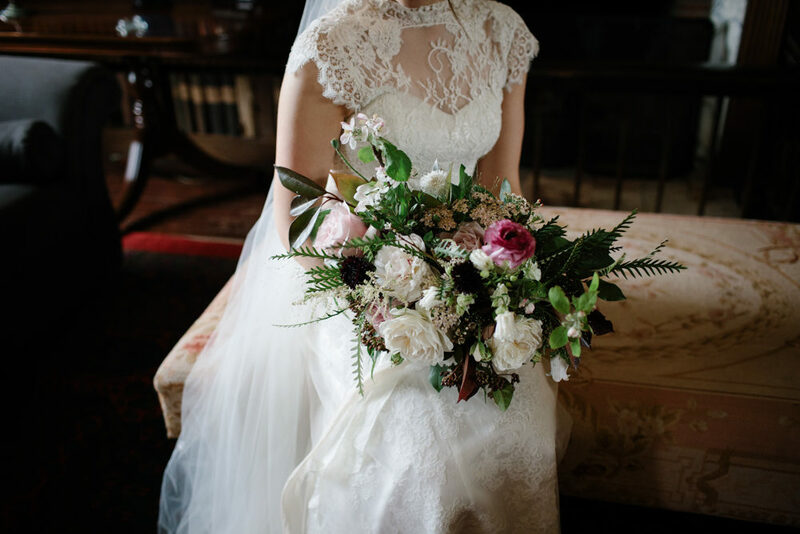 Once the dress arrived in Edinburgh, I took it to Gemma Sargent whose incredible team made me a bespoke lace top for it which turned out beautifully. The best part about it is the top is detachable, so I can wear it again! 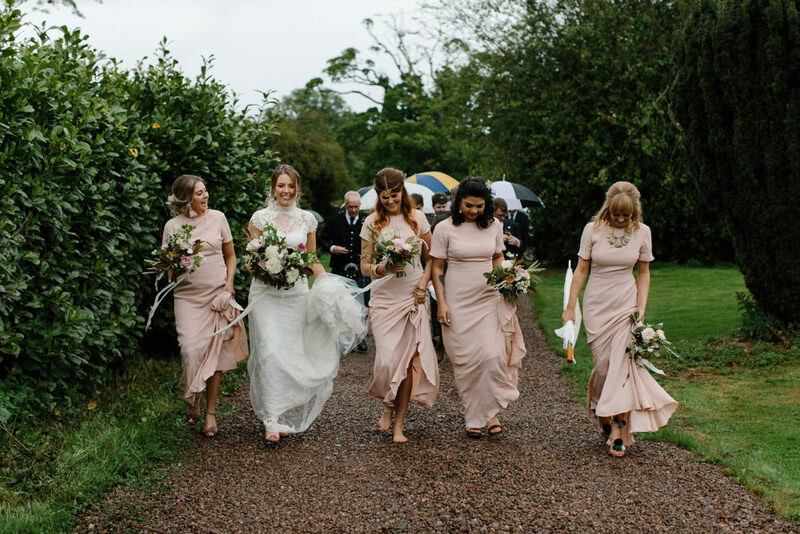 We chose blush pink for the bridesmaids to go with the rustic golds of the Coach House, and blush pinks with marsala to contrast for the bouquets. 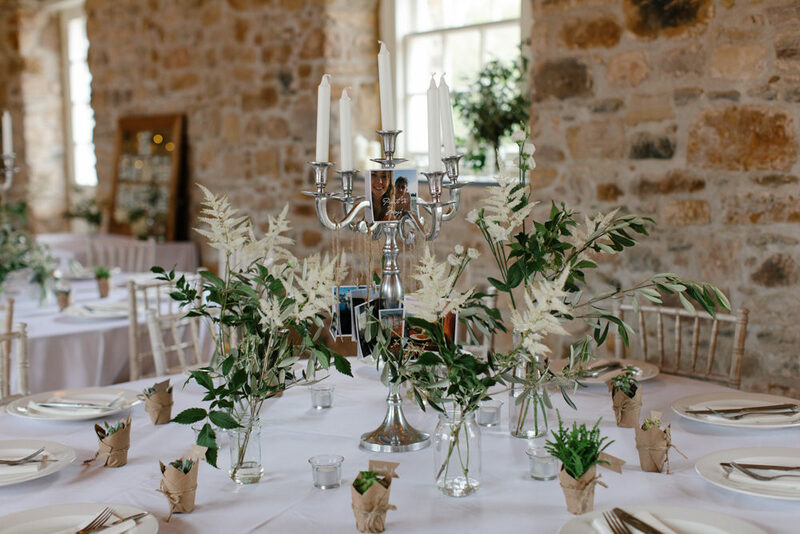 For the venue flowers we kept it simple – white & lots of greenery to keep the look fresh and simple, and not too fussy. Our friends painted lots of beautiful signage for us to help guide our guests around the estate. We named each table after places that meant a lot to us, and decorated the tables with photos of some of our favourite memories from those places. One of our favourite memories of the weekend was the hive of industry the day before – 20 of our friends and family working so hard with us to help us build the set for the best day of our lives. We were really blown away by everyone’s kindness. We used to live on the same street as Edinburgh Larder Bistro and their outside catering menu was just perfect – seasonal, rustic buffet with lots of options for the vegans & gluten-frees in our group! The food was so delicious and looked incredible. 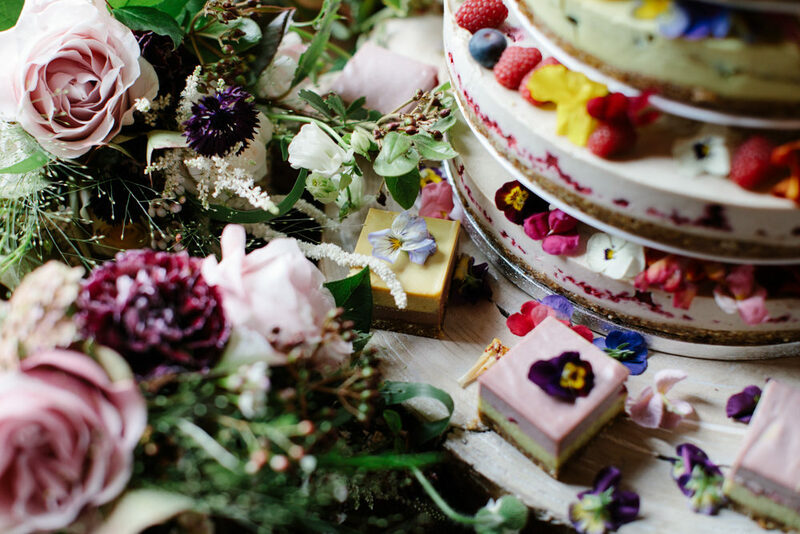 An incredibly talented friend of ours, Lewis Gill, owns Grams – a health food cafe specialising in dairy free, gluten free and refined sugar free cake. The cakes are usually sold in individual slices and are like miniature works of art. We knew that a whole wedding cake created by him would look stunning – and it did! He did such an excellent job, and we received so many compliments on it. Best of all, it suited all of our guests’ dietary requirements, of which there were many! We were blessed with an incredibly talented army of helpers in the run up and the day before the wedding. I was very lucky in that all of my very talented bridesmaids went to art school, and so our DIY floral arch and venue flowers turned out perfectly. 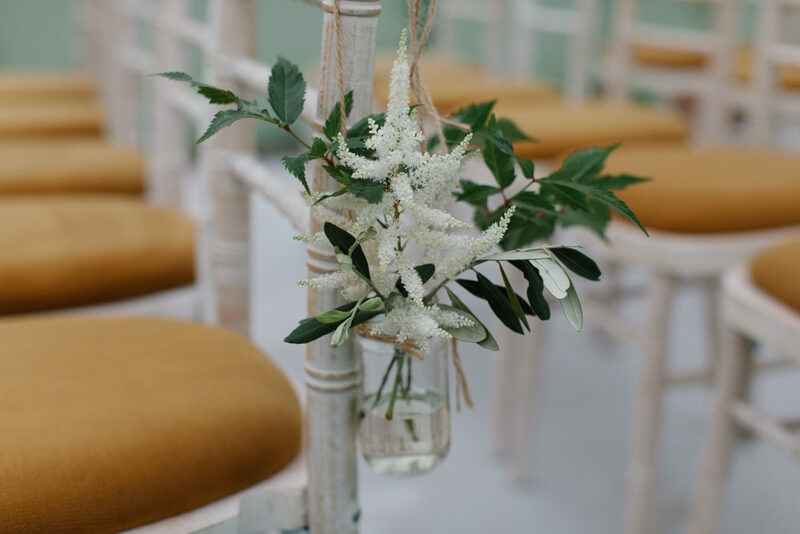 The key was to keep it simple – one main greenery (we chose olive branches) & one low-maintenance flower (ours was Astilbe Washington). These were both easy to condition and store in the days before the wedding, and arrange the day before. Our friends and family saved up jam jars and bottles, and we used these to hold the flowers dotted everywhere across the estate. We hung them at the pew ends and from the hayloft – simple yet effective! Probably the most surprisingly easy thing to do ourselves was the garland for the archway that our friend had built for us. 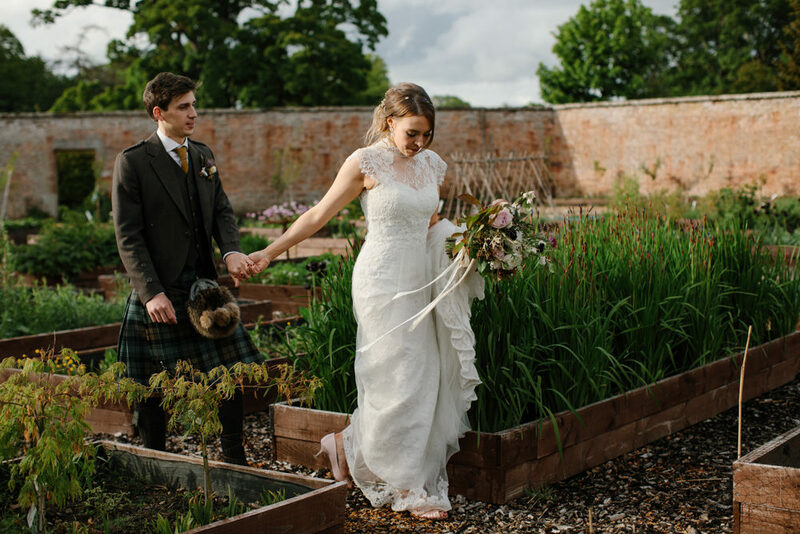 That frame around the pretty view into the walled garden made the perfect ceremony back drop. Although we did the venue flowers ourselves, I decided to use a florist for the bouquets & buttonholes to take the pressure off a bit. I had come across Rose & Ammi’s stall at a wedding fair and loved Lydia’s rustic but pretty style. She did such a fantastic job with the bouquets & buttonholes, and was as patient & helpful as I was indecisive! My bouquet was far too beautiful to throw on the day, and before we left for our honeymoon I hung the flowers to dry them, and they now sit on my mantelpiece at home. I heard about Colstoun through a friend after relaying our struggle trying to find the perfect relaxed yet beautiful wedding venue. We were really taken by the beauty of the whole estate, and also the ethos that Colstoun has. We were thrilled that we were able to do everything the way we wanted it. It was great that the estate had lots of bedrooms and cottages for our friends and family to stay over too, as we wanted our guests to be able to relax and enjoy themselves without worrying how they were getting home. On the night of our wedding, we had a great time sitting around the fire pit roasting marshmallows after everyone else had left, and the group breakfast the next day was really good fun. It really was the perfect place for our wedding weekend, and I was so happy to have found it! I came across Caro first of all at the Wedding Collective market at the Biscuit Factory and immediately fell in love with her relaxed yet exquisitely beautiful images. I then started noticing that the images on wedding blog posts I loved the most all happened to come from Caro! We were so thrilled that she was available on our date, and we weren’t disappointed. Caro was fantastic the whole day – the shots she got without us even noticing managed to capture so many of our favourite memories of the day. Pretty Ugly were a no-brainer for us. Lynne is a friend of ours and we knew they’d do an excellent job, and that they did! You know it’s been a good one when all of your wedding guests pick you & your husband up to crowd surf across the dancefloor at the end of the night! Don’t be afraid to ask for help! 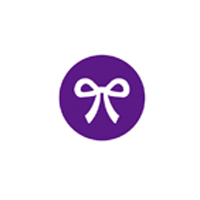 Your friends and family will want to be a part of your big day, and will want to help make it happen. Sean and I were absolutely blown away by the generosity and sheer creative talent of all of our friends and family. Everyone we know and love pulled out all the stops to make our day what it was, and it meant the day wasn’t just a celebration of Sean and I’s love for each other, but also a celebration of the love of our friends and family.